The A-League is Australia’s premier national football competition, having replaced the defunct NSL in 2004. Kicking off its inaugural season in 2005-06, the A-League currently features ten teams – nine from Australia and one from New Zealand, but that number will rise to 11 next season and 12 in 2020. Of the original eight clubs, seven still remain in the competition. Adelaide United, Brisbane Roar, Central Coast Mariners, Melbourne Victory, Newcastle Jets, Perth Glory and Sydney FC have competed in the competition since inception, with the New Zealand Knights being replaced by Wellington Phoenix in 2007. Attempted expansion in the late 2000s proved unsuccessful, with Gold Coast United and North Queensland Fury both joining in 2009 but dissolving within three years. Since then, however, the league added Melbourne City (originally known as Melbourne Heart) and Western Sydney Wanderers to great success, and will add team in Western Melbourne and Macarthur-South West Sydney over the next two years. Currently, A-League teams play 27 matches every season – three against each of the other nine clubs. The top six clubs progress to the A-League finals, with the elimination series culminating in the grand final – where the champions for the season are decided. 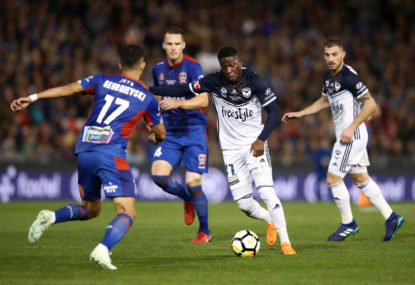 The 2017-18 season was won by Melbourne Victory, after they defeated the Newcastle Jets 1-0 in the grand final.